Okonomiyaki is a popular Japanese food that literally translates to 'as you like it'. The idea in okonomiyaki restaurants is to choose your fillings & then either cook your pancake at your table on a griddle set into it, or to sit at the counter & watch the chefs prepare it for you. Either way it's a fun experience & one I did often during the time I lived in Japan. The recipe below is approximate because I never learnt how to make this from a recipe, but by helping a Japanese friend in her kitchen. It's very hard to get it wrong though, so whatever you choose to add to yours will surely turn out well! Generally okonomiyaki contain cabbage, but other combinations of fillings can vary greatly. Mix together the flour, milk and egg until you have a consistency like pancake batter. Add in all your other ingredients & any seasonings. Your batter should coat all your ingredients but not overwhelm them. Heat a little oil in a large frying pan. Drop in a tablespoon or two of the mixture & flatten down in the pan. Cook on both sides until golden brown. 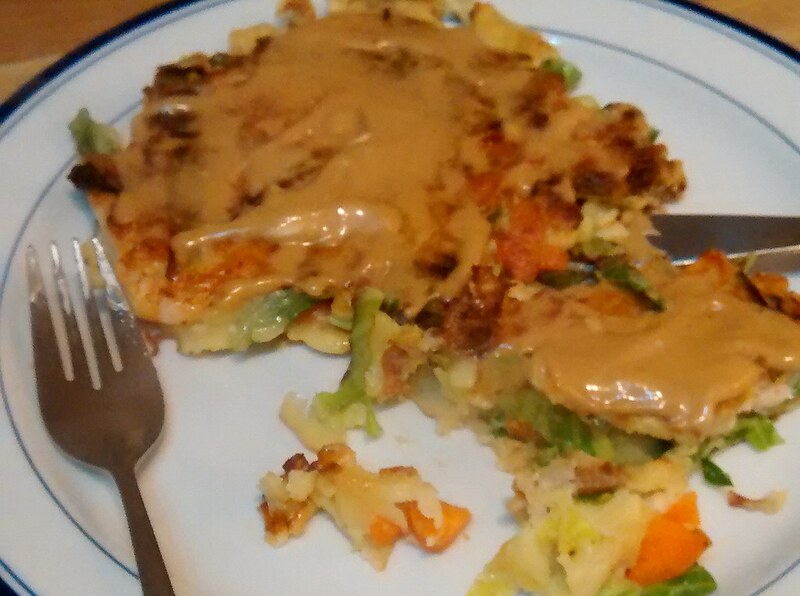 Mix together some okonomiyaki sauce & mayonnaise until it's a beige/pale brown colour. Spread it over the pancake & sprinkle with bonito flakes.